Subsidies for ‘Free’ Golf Carts? While many Michigan taxpayers may be laughing or angry at the revelation by Fox News' John Stossel that he obtained a "free" golf cart using special tax breaks and giveaways for electric cars [video], very few may realize that Michigan's lawmakers have been altering this state's business tax code to provide special credits and giveaways for the industry that creates these cars. Most recently, on Dec. 31, 2009, Gov. Jennifer Granholm signed into law House Bill 5469, which expands a taxpayer subsidy for makers of electric car batteries. Two weeks earlier, overwhelming majorities in the House and Senate voted to approve the bill — only nine lawmakers out of 148 voted "no." After consulting with an Arizona retailer that literally advertised a "FREE ELECTRIC CAR," and then legally exploiting the generous subsidies contained in the U.S. tax code, Stossel whittled the $6,490 sticker price down to zero and then paraded his taxpayer-financed toy on Fox's Bill O'Reilly show. Explaining the gambit, he noted that a large portion of his funding came from a tax credit of "$417 for each kilowatt hour of traction battery capacity in excess of four kilowatt hours." House Bill 5469 — now Public Act 240 of 2009 — expands upon Public Act 580 of 2008, a law that allows qualified manufacturers to claim credits of $375 for each battery pack of at least 4 kilowatt hours capacity that they produce, and $93.75 for each additional kilowatt hour, up to a maximum of $1,500 per battery. The 2008 law allowed for four battery makers to claim these special tax breaks when filing their Michigan Business Tax; House Bill 5469 adds three new recipients sharing a slightly larger subsidy between themselves. Stossel told O'Reilly that his golf cart subsidy happened because "our bloated government subsidizes everybody" and that it is part of "endless subsidies that are taking us on a road to serfdom." He also noted that the federal subsidy used to purchase his golf cart was the work of U.S. Rep. Charles Rangel, D-New York. 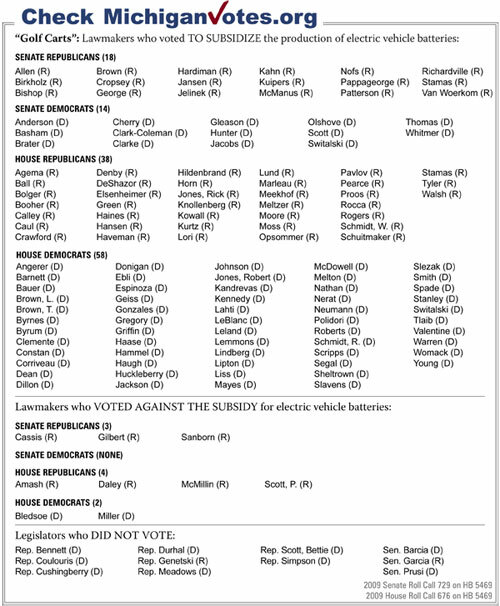 The Michigan lawmakers who supported HB 5469 have a different view of special tax breaks for electric cars and electric car batteries. State Sen. Roger Kahn, R-Saginaw, hailed the passage of the bill as "tremendous news for the Great Lakes Bay Region" because he believes that it will bring battery-making jobs to an area within or nearby his district. Kahn's news release was issued jointly with state Sen. Tony Stamas, R-Midland. In the state Senate, only three lawmakers opposed HB 5469: Sen. Nancy Cassis, R-Novi; Sen. Jud Gilbert, R-Algonac; and Sen. Alan Sanborn, R-Richmond. In the House of Representatives, only six lawmakers voted against HB 5469: Rep. Justin Amash, R-Grand Rapids; Rep. Tim Bledsoe, D-Grosse Pointe; Rep. Kevin Daley, R-Attica; Rep. Tom McMillin, R-Rochester Hills; Rep. Fred Miller, D-Mount Clemens; and Rep. Paul Scott, R-Grand Blanc. The bill passed the House on a vote of 96-6, with 38 Republicans joining 58 Democrats in support of the special tax break. It passed the Senate on a vote of 32-3, with the support of 18 Republicans and 14 Democrats. The Michiganvotes.org roll call vote for House Bill 5469 is above. The original version of this story and a video of Stossel talking about his golf cart is at www.MichCapCon.com/12127.